courage and strength, during the time when female were considered lesser and inferior counterpart of the male species. She was a ray of hope of every wife, mother, and daughter whom for a long time had been hiding in the shadow, voiceless, intimidated and disrespected...For us, she was the answer to all the prayers that were whispered in secrecy from the lips of our great, great grand female ancestors. She had showed her unwaivering quest for justice, freedom, equality and her dauntlessness in upholding her ideals even unto her untimely death. Others may have different and contradicting opinion about her...Of her political views and practices. Mrs. Indira Gandhi's political rivals may have painted her as a corrupt leader who resorted to illegal proceedings just to maintain her power and position. I'd say every political figures who have reached and tasted the zenith of power were not immuned to greediness and self-indulgence . What made her stand out more was when she admitted to her mistakes and faced all her demons...For courage comes in many forms and shapes, it does not follow a common rule or pattern. A person may show his/ her will and true valor in several ways and in varying degrees. It is the courage to speak up and stand-up to defend one's name or honor, the courage to remain calm and silent when peace and diplomacy are at stake...The courage to admit defeat when you know that not all battles can be championed. Most of all the courage to show the real side of you, as human being without any tinge of pretense...The courage to love and lost and marvel with the reality that ''Yes! we are human with a heart, a conscience and a soul!" Nice to read how inspired you are with Indira Gandhi. Good work. 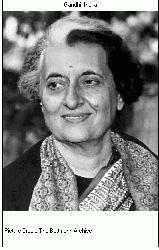 I admire Indira Gandhi a lot....glad to read an article on her. Thanks for the time Vimala, wished I was with you then...Only saw her still pictures and a few glimpse of her on air/ T.V. Isabel, you seem to have caught the very essence of Indira Gandhi's personality. I had the occasion to see her at very close quarters,once in Delh and once in Agra. A truly impressive personality, she was.